I love Norway and am so pleased to announce that I will be doing 2 full day workshops and one evening masterclass in the beautiful city of Oslo. All the info you need including prices are on the official website. Click the image below to go there. But hurry! Booking closes on the 30th April and the workshops only have 20 places each. I am pitching these at intermediate level users. People who have already used the cameras but want to maximise their potential. 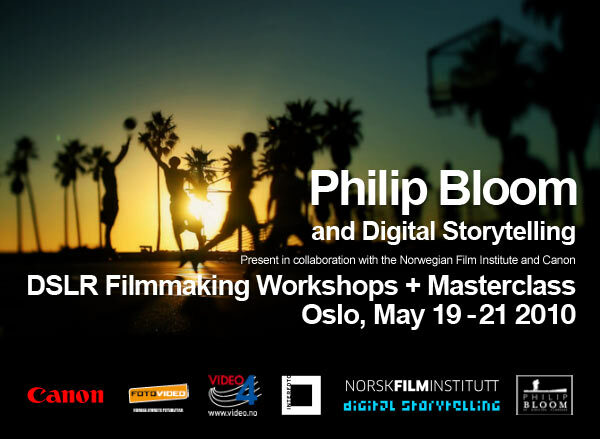 Philip Bloom and Digital Storytelling present in collaboration with the Norwegian Film Institute and Canon two DSLR Filmmaking Workshops and an evening Masterclass lecture in Oslo, Norway on May 19 through May 21. World renowned filmmaker and Director of Photography Philip Bloom comes to Oslo Norway to give two full day hands-on workshops and one 3 hour evening Master class lecture on DSLR based filmmaking. The lecture is open to professional cinematographers, photographers, technicians, producers, directors, filmmakers wanting to learn about the possibilities and challenges of the new DSLR based filmmaking workflow. Canon and partners will demonstrate Canon EOS DSLR cameras and supporting gear for DSLR filmmaking on the 2nd floor gallery space at Filmens Hus before and during the break of the evening master class lecture on Thursday May 20th. Master class participation is limited to the 195 seat capacity of the Tancred movie theatre.Particpiation will be on a first-come first served basis by email registration. Two hands-on all-day workshops for up to 20 professionals each will be held on Wednesday May 19 and on Friday May 21. The workshops are targeted for video and film DPs and stillphotographers wanting to learn DSLR filmmaking. Canon will be providing a number of HD video enabled DLSR cameras for use during the workshops. The workshops will be held at Villa Stenersen, a 1938 architectural masterpiece in Oslo. Come join us and get to see for yourself how DSLR based films look in a state-of-the art movie theatre and learn about the future of filmmaking with Philip Bloom in May! For more information please email Director Kim Baumann Larsen at kim @ digistorytelling . com or call +47 415 62 585. To register send an email with your full name, title, company affiliation, cellphone and invoice postal address to masterclass @ digitstorytelling . com with “Philip Bloom Masterclass May 20? in the subject line. Send your application for participation including your short CV (max 1 page) by email to workshop @ digistorytelling . com with either “Philip Bloom Workshop May 19” or “Philip Bloom Workshop May 21” in the subject line. Will your full day June 19th Toronto Workshop be intensive as well? Also are there limited spots for the Toronto one?? And Poland? Philip when we can expect you in Poland? Lots of great scenery and timelapse opportunities. workshops in Stockholm in the near future. Is the afternoon seminar only for professionals? Not sure if I can come during weekdays, busy with schools. Hey Philip, will you ever come to germany!? Hey Philip, will you ever come in Paris one day? I’m sure there will be plenty people attending to your workshops! do you plan coming to Portugal or Spain ? Please bring your Noktor f0.95 to. Would be awesome! None of the email addresses above worked. Anyone had the same problem? Just got the mails i’ve sent in return. I really wanna go to this masterclass lecture! Please help! Great program for this wrokshop ! Plan the same in Paris and here I come. You think that you come to holland this year. Otherwise I come to norway to follow a workshop of you. I was planning on flying in from Miami, but just got a gig on that same day. Oh well. See you on the next one Mr. Bloom and friends. You should come to The Netherlands Phil! It’s only one hour away from the U.K, so you’re close to home. Please let us know! Yeah Just like Tim i would love to see a masterclass in the Netherlands! I hope you’ll consider contacting them. I just want to say thanx a MILLION for a great workshop on the may 21. This was just what I needed (and almost what the doctor ordered. I actually got a videogig today, and now I got the courage to take it, just got to buy some more soundgear…..